The sweet onions are being harvested and are as yummy as ever! For the next two months, delicious, local sweet onions will be available at Farmer's Market and roadside stands. They are so good! We are enjoying them every possible way. For the past several years I have enjoyed making Sweet Onion Jelly from a recipe my mother shared with me. It's delicious for tea or when entertaining guests. For a pretty presentation, place a block of cream cheese (soy if preferred) on a pretty plate and then pour a portion of the jar of jelly over the cream cheese. 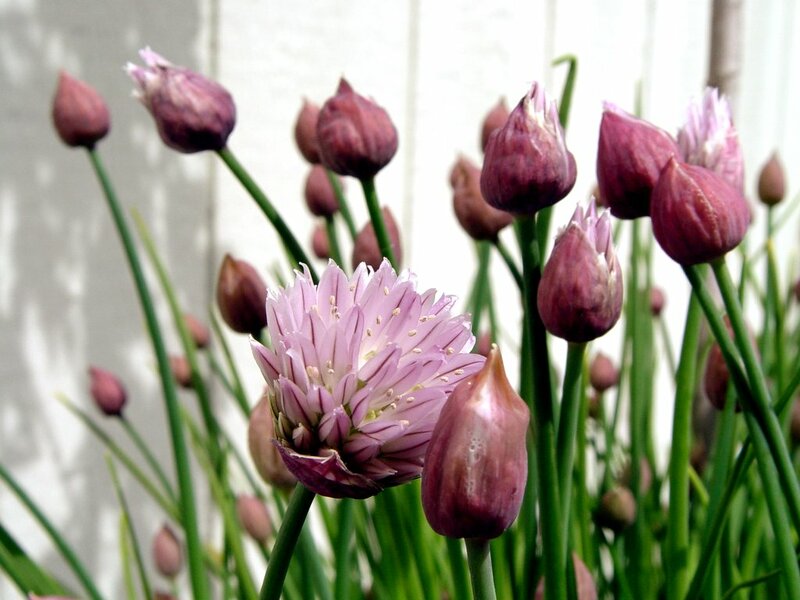 Garnish with some chive blossoms and place crackers in a basket nearby. Perfect for dipping, it's a delicious combination of savory and sweet jelly with salty, crispy crackers. I found another recipe today for a similar jelly. It was published in the Syracuse Post Standard. This version has the addition of garlic for enhanced flavor. Cut top off each garlic head and drizzle with olive oil. Roast at 275 degrees for 1 hour and 15 minutes. Cool completely.Caramelize onions: chop onions into small pieces (save half of 1 onion and cut into large slivers; set aside to be used later as a garnish). Place 2/3 cup sugar in a large skillet over medium heat and cook until melted; mix in butter until melted. Add onions and cook until coated by caramelizing mixture (onions should be soft and pierce easily with a fork). Caramelize large slivers and set aside.Add garlic cloves from one head and simmer 5 minutes. Add vinegar and mix while still over medium heat; mix in 4 cups water and simmer 5 more minutes. Sieve mixture through a jellybag or cheesecloth, allowing to drip until all liquid is through.Measure 5 cups of the garlic/onion liquid into a saucepan and add pectin. Bring to a full boil and add all the sugar at once. Cook at full rolling boil, stirring constantly, for 1 minute.Remove from heat and ladle mixture into hot, sterilized jars. Garnish top of each jar with a large sliver of caramelized onion and a clove of roasted garlic. Put lids on and process 10 minutes in boiling water bath. Store in a cool, dark place. That sounds intriguing, especially the bit where it is poured over cream cheese and served with crackers. Oh does this sound good. Loving onion and garlic things these days. I have been making red onions with lime juice and a little salt. It is so good on tacos or sandwiches. Then grilled white onions last night to put on tacos. Now you give me onion jelly on cream cheese. Oh my!